Hi, I´m an English and German teacher, and my work can also be downloaded for free on iSLCollective.com , so please don´t report my worksheets as stolen! You can also upload your work and download ESL resources there. 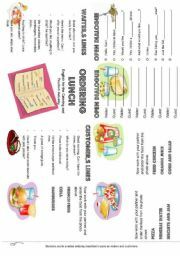 Menus for role play in a different types of restaurant. 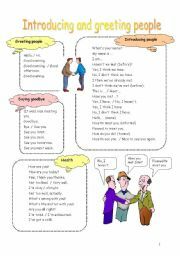 Vocabulary and phrases needed for introducing and greeting people. 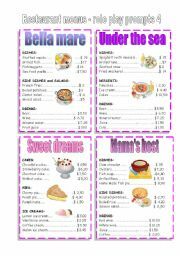 With this WS you can revise food and restaurant vocabulary used in my restaurant menus cards. 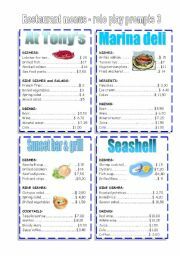 Here are some new menus for your role play in a restaurant!Check out the first 3 as well! 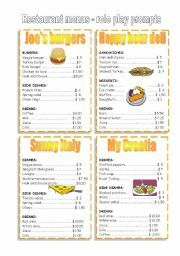 A few members asked me to make some more restaurant menu cards so here´s a new set, I hope you like them as much as the rest! 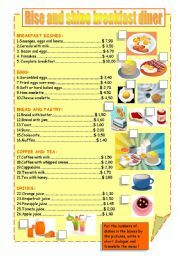 Breakfast menu - vocabulary exarcise, writing a dialogue in a restaurant and translation exercise + match up activity with pictures. 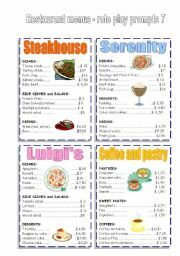 New restaurant menu prompts. Check out the first two if you like this one: http://www.eslprintables.com/printable.asp?id=183310#thetop http://www.eslprintables.com/printable.asp?id=183338#thetop I hope your students have fon as well as mine do with these cards! Easy dialogue with exercises and some food vocabulary. Explantions and examples of different types of pronouns. Very simple dialogue between a waiter /waitress and a customer, with some food vocabulary. Instructions on the last page. Verb to be in positive, negative and interrogative + exercise. Useful phrases when writing formal e-mails or letters in English. 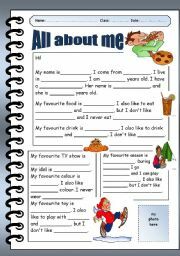 Very simple, short dialogues, to do in pairs or in groups, to write, memorise, play, role-play - many possibilities with this Powerpoint, with many photos of people in a restaurant and photos of different kinds of pizzas. 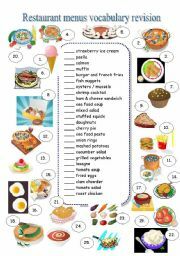 Breakfast vocabulary and adverbs of frequency, fill in exercise and writing task. Kitchen verbs with photos and explanations. 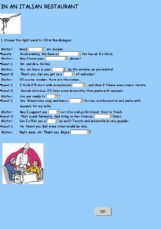 Multiple choice exercise - dialogue in a restaurant.